QUESTION: What’s The Diagnosis In This Child With Lower Extremity Pain? QUESTION: What Condition Does Mini-Me Have? A child presents with a PAINFUL lower extremity. The pediatric board question states that he also has “decreased exercise tolerance.” You’re asked to identify the disorder. His cardiac and pulmonary exam are unremarkable but an x-ray of a LONG BONE is shown with various findings. 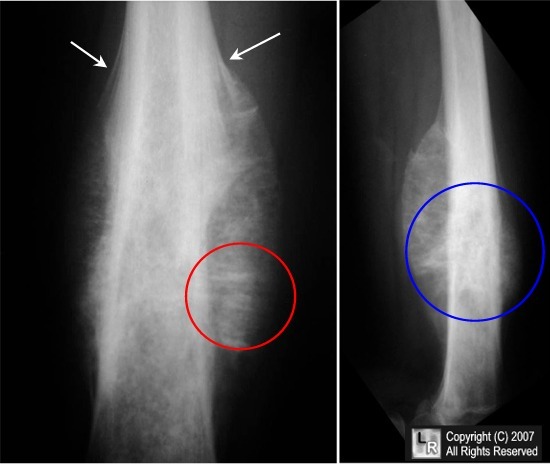 Of the multiple findings in the images below, the white arrow points to the “classic” finding associated with this disorder. 1. Can you name the disorder? 2. Can you name the classic findings shown in the images? For the answer, CLICK HERE or just get the PBR core pediatric study guide.